Find hotel near Burgundy Evasion Bike Tou .. 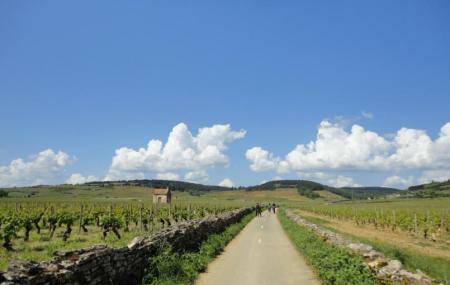 This is a fantastic road tour to explore the beautiful vineyards of France. Florian is an awesome host and guide and goes till all extent to make you feel comfortable. He will take his van and guide you along the whole tour. The views and rough terrains are gorgeous and adventurous and having wine and snacks on top of a hill is just marvelous. As you ride along, Florian stops at regular intervals to tell you all stories about wine making and these gardens. He is very knowledgeable and knows all the areas very well. How popular is Burgundy Evasion Bike Tours? People normally club together Taste Burgundy Wine School and Chemins De Bourgogne while planning their visit to Burgundy Evasion Bike Tours. People also prefer to end their day with Burgundy Evasion Bike Tours. My wife and I took the one-day tour in Burgundy with Flo and it was fabulous! Flo is very knowledgeable about wine, winemaking and the vineyards. I thought I knew quite a bit and found that I did not. Tastings were excellent, the first one on top of the ridge overlooking the valley with wine from Flo's pannier. Lunch in Puligny-Montrachet was very elegant, not just some brasserie on the street, but an elegant sit down restaurant. Food was excellent. Flo is very safety conscious and shepherds his flock to avoid any accidents. Bikes were very adequate and well taken care of. This is well worth the money! A group of 20 of us visited Burgundy and we booked this bike tour, so Florian gave us a private tour from Beaune, through Pommard and Vernay and back to our chateau. He was friendly and knowledgeable, and was good at shepherding those that fell behind or rode ahead. Very enjoyable, would recommend this to anyone visiting the Côte de Beaune. Très arrangeant, vélos impeccables, conseils avisés.